Life everlasting is a fragrant, herbaceous annual plant; the erect, branched, white-woolly stem grows 1-3 feet high and bears alternate, sessile, lanceolate leaves that have wavy margins and are dark green above and white-woolly beneath. Yellow flower-heads grow in several terminal panicled clusters from July into September. 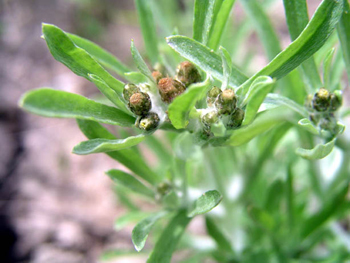 Other varieties: Low cudweed or marsh cudweed (G. uliginosum) was smoked by Native Americans to cure headaches; Pearly everlasting (Anaphalis margaritacea) called Pearly everlasting, was once called Lady’s tobacco, has basically the same properties as life everlasting (G. polycephalum); Sweet everlasting, also called Rabbit tobacco (G. obtusifolium). Grows in dry fields, open pine woods, and clearings in the Atlantic coastal states and west to Kansas and Texas. In Colonial America, pillows were stuffed with native life-everlasting, for its delicate and soothing aroma. The pillows were especially used for consumptive patients. Life everlasting was a popular smoke among European peasants. An infusion of life everlasting, taken as a tea, is useful for lung problems, leukorrhea, and intestinal problems, including hemorrhage. The cold infusion helps expel intestinal worms. A homeopathic tincture is used for sciatica, lumbago, and some kinds of arthritis. The fresh juice is used to calm excessive sexual desire. Externally, it makes a good fomentation for bruises, wounds, and ulcers. The dried flowers are used like hops for a calming herb pillow. As a mouthwash and gargle, the infusion is good for sores in the mouth and throat. The fresh herb can be chewed or the leaves applied for external problems. Infusion: steep 1 tsp. leaves and flowers in 1 cup boiling water. Take 1-2 cups a day.